Overhead conditions were dull and overcast at Chaffer’s Field, but underfoot the ground was good for running rugby and the game was full of pace and skill. The adage that you can only play as well as your opponents allow was very apt on Saturday as the visitors were unable to show their true potential. Ensians put pressure on right from the kick-off and after the first scrum when Castleford looked as though they would dominate up front, it was the home side who took charge. Tackling from both teams was intense and the visitors gave the home side several chances to gain field position by giving away penalties. Kicking to the corner rather than at goal kept ‘Ensians in the opposition 22 and eventually from a line-out, ball “off the top” was moved through the hands to the right, retained from the ruck and then lovely passing to the left gave winger Will Prest a strong run to the corner. The conversion narrowly missed and after quarter of an hour the Old Boys had a five nil lead to show for their efforts. Castleford were showing frustration and incurred the displeasure of the referee on several occasions. From a free kick No. 8 Rob Arbuckle made ground. Two high tackles by Castleford gave ‘Ensians more kicks to the corner and the visitors just didn’t get into their stride. A break by their fly half looked dangerous, but his kick ahead went dead and a chance to open their account was lost. The home side won another penalty and a great relieving kick put them back into an attacking position. Greg Jones from prop was causing problems with determined runs and he was rewarded with a try after a text book driving maul from a line-out, with backs piling in to add weight, put ‘Ensians further ahead. Kristian Keinhorst converted. Castleford then enjoyed a period of sustained pressure before the break, but Otley defended well and a relieving kick saw off the danger. Half time came with the score at 12-nil. On the resumption Castleford realised that they could play some rugby and an interception gave them a great opportunity to turn this into points Superb chasing and covering tackles by ‘Ensians averted a try, but the visitors kept up the pressure, with a penalty then a scrum on the goal line. A strong shove, pick-up and a dive over put them on the board with five points, the conversion failing. Castleford had regained confidence and the home side dipped somewhat into some sloppy play. Taking a man out in the air came after a penalty to the visitors had already been awarded and clearly ‘Ensians needed to settle down again. The penalty was duly converted and 12-8 became the score- line. Possession came the way of the home team and they gained ascendency again with some good handling and kicking for position. Winger Declan Jackson chased a chip ahead, overtook the opposition and scored wide out. A fine conversion from Kristian made the score 19 points to 8 and the situation looked comfortable enough for the home side. 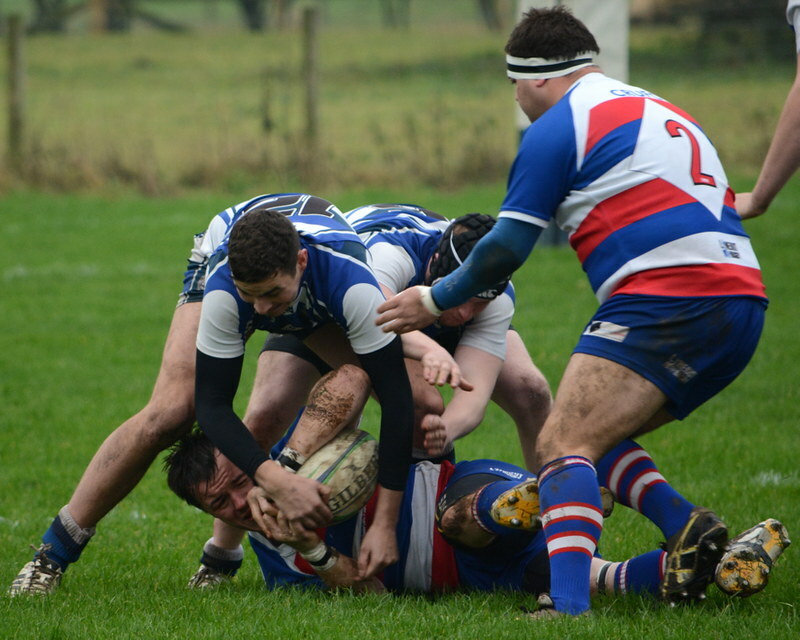 However, Castleford came back into the game in great style and ‘Ensians began conceding penalties. Their defence, however, was outstanding, with desperate tackling continuing to be a feature of their team effort. A series of Castleford penalties proved too much in the dying minutes and a converted try gave the scoreboard its final tally: ’Ensians 19points, Castleford 15 points. A good one to win; a man of the match would have been difficult as this was truly a squad success, but Jim Dyson’s three strikes against the head were highlights indeed.